A garage can be a blessing in any home as it is an additional area for storage. Garages can be used to house vehicles as well as items you don’t use every day such as lawn equipment or holiday décor. However, in older homes, a garage can be rundown and need to be replaced. Or, sometimes Mother Nature doesn’t give you a choice. Garage demolition is required in most situations. While tearing down a garage can be fun, it can also be dangerous. Learning how to do so safely will ensure your project continues without a hitch and no one gets hurt. When you try to take down the garage yourself, you will most likely be unaware as to how to properly plan the garage demolition. Certain aspects should be considered for safety, as well as success, such as electrical connections and clean-up. By hiring a professional like Kloos Hauling, you will have a team of professionals on hand who will not only prepare the property for the garage demolition but also complete the process in the right way. While you may think that you can easily tear down a garage, it’s not so simple. If your garage is attached to the home and you start ripping stuff down, you can do more damage than you realize. By hiring a professional, you are covering all your bases. If your garage is a stand-alone structure, doing the demolition yourself, you are risking injury and have to use your valuable time. Some things are just best left to the professionals. First, the pros know when permits are needed for garage demolition, so those are obtained for you. Second, the pros know how to take down the garage so that your home or surrounding property is not damaged, and no one gets hurt. Many times, a demolition project requires the help of machinery, which professionals have, unlike the homeowner. The right tools are provided for the job, ensuring the garage demolition is completed in a safe and timely manner. Besides having your garage will be demolished correctly, Kloos Hauling and Demolition can haul all materials removed from your property. In some situations, the clean-up can be the most difficult part of any demolition project. 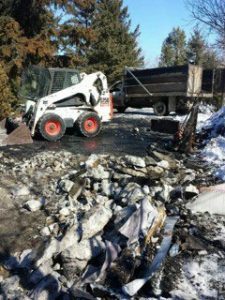 With Kloos Hauling, the demolition process includes clean-up, so there is no huge pile of junk left at your home after the garage has been removed. Kloos’ demolition service makes it easy to begin your new garage build for your home. Get in touch with Kloos Hauling and Demolition to schedule your garage demolition today! Posted in Blog and tagged Demolition, Garage Demolition, Junk Removal, Residential Demolition.